Airpots are containers for storing and dispensing coffee or other beverages that maintains a constant temperature by use of insulation. They are ideal for a breakfast buffet, cafeteria, coffee shop and even at home. Airpots also allow your customers to conveniently serve themselves if needed. 9" X 9" X 13"
The Paderno World Cuisine push-button airpot has a capacity of 2 quarts. It is constructed of stainless steel and has a sturdy black lid and handle. The handle makes it easy to transport. It is ideal for a breakfast buffet, cafeteria or coffee shop. Material: Stainless Steel.Capacity: 2 Qt. The Paderno World Cuisine push-button airpot has a capacity of 3 5/8 quarts. 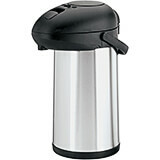 It is constructed of stainless steel and has a sturdy black lid and handle. The handle makes it easy to transport. It is ideal for a breakfast buffet, cafeteria or coffee shop. 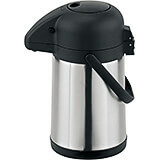 Material: Stainless Steel.Capacity: 3.63 Qt.